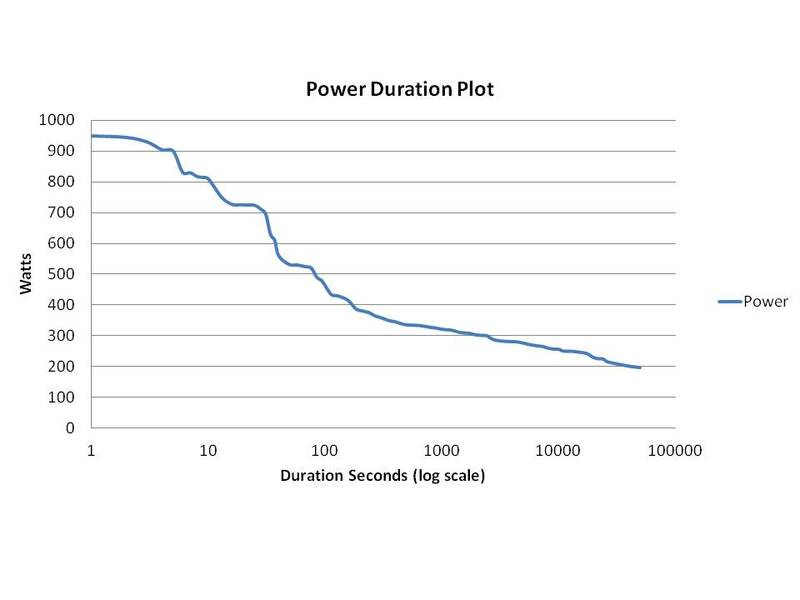 Traditionally cyclists have used a Power Duration plot to visualize the Mean Maximal Power that can be sustained for any given duration. 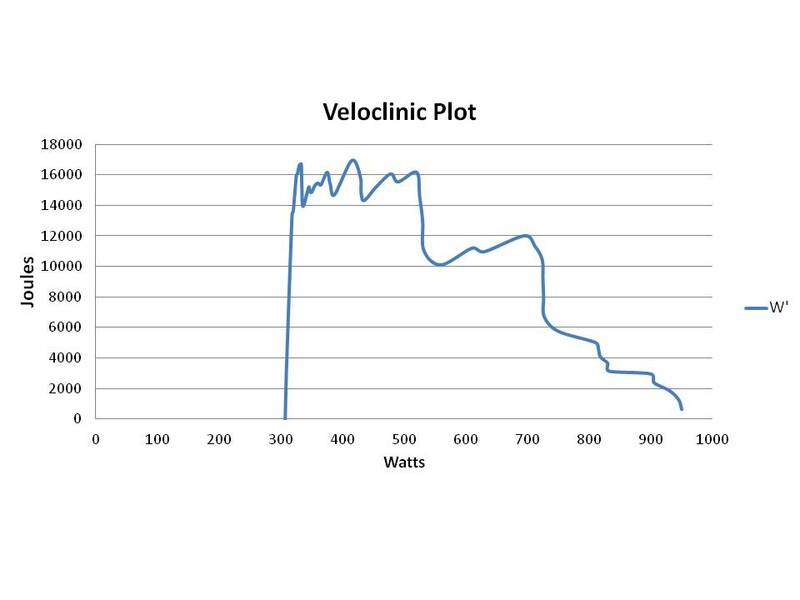 The Veloclinic plot on the other hand is a Work Power plot which shows the maximal amount of work that can be done for any given power minus the work done by CP. The first step in plotting the data is to calculate the total work that can be done at any given power (work = power x time). Next the work done by CP is subtracted out (work = total work – CP x time). The remaining work is then plotted showing the maximum work that can be generated from W’. Since it is only the W’ derived that is then plotted it makes sense then to think of the curve as a W’ plot. 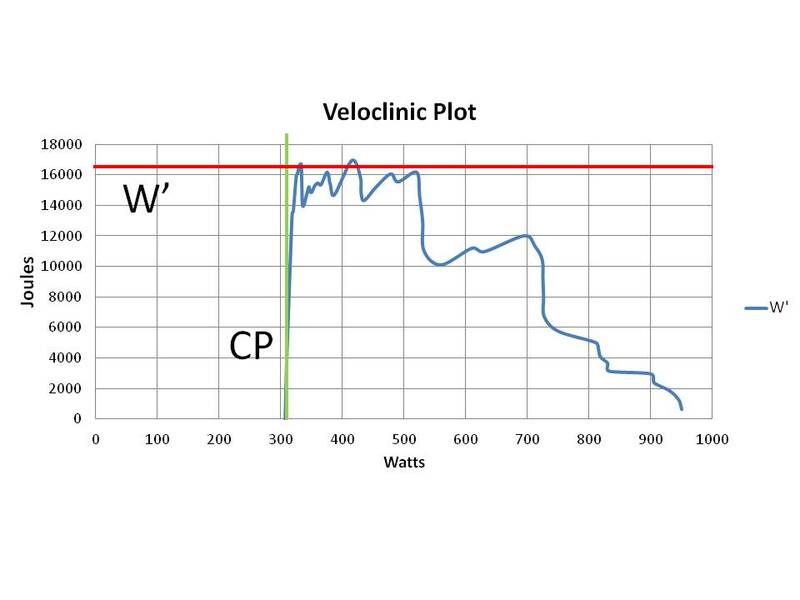 The motivation to develop the VC plot came out of frustration that the Power Duration plot does not allow direct visualization of the current evidence based gold standard performance metrics W’ and CP. In the traditional PD plot. The y axis is power and the x axis is duration. The x axis is typically converted to a log scale so that details of the curve can be better brought out. Even on a semi-log scale however, the only performance measure that is visually clear is Pmax. In contrast, on the VC plot, CP is visually obvious as the first x intercept. Just as clear, W’ is the y asymptote and Pmax the second x intercept or asymptote. If the model is fit correctly (and the data set is of adequate quality), there will be a clear W’ plateau across the region of power corresponding to the 2-20 minute range of the Power Duration curve. 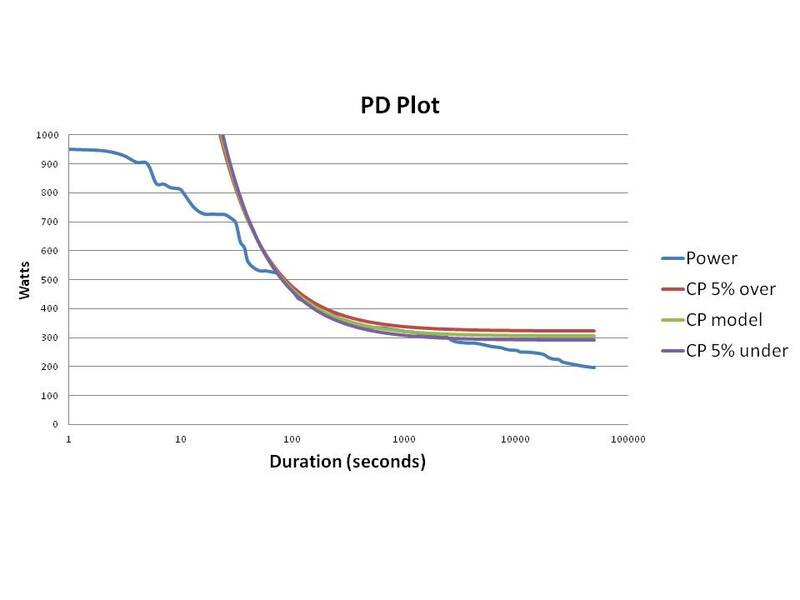 Of course, CP can be plotted on the traditional PD curve. The impression though is of a straight line randomly intersecting a slant. 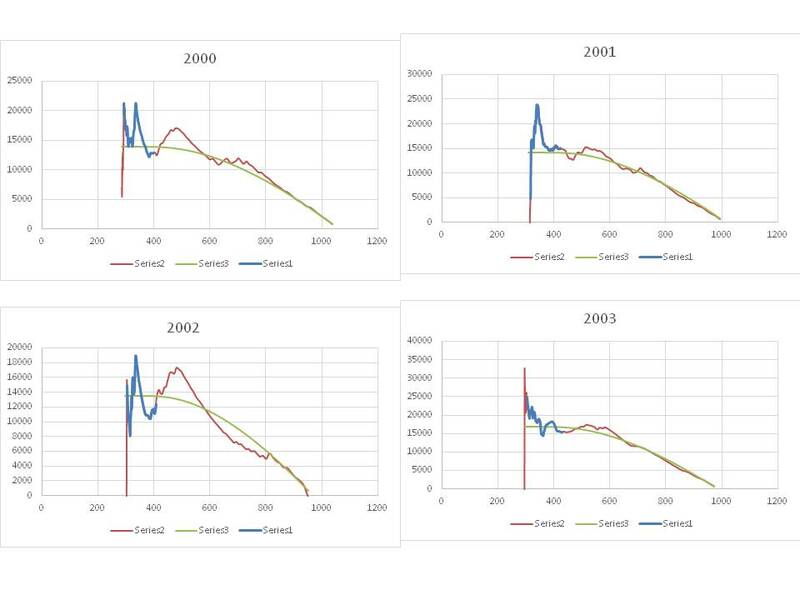 There is no obvious visual feedback whether the CP estimate is correct or a curve fitting artifact. Even more problematic is illustrating W’ as neither scale is in units of work. 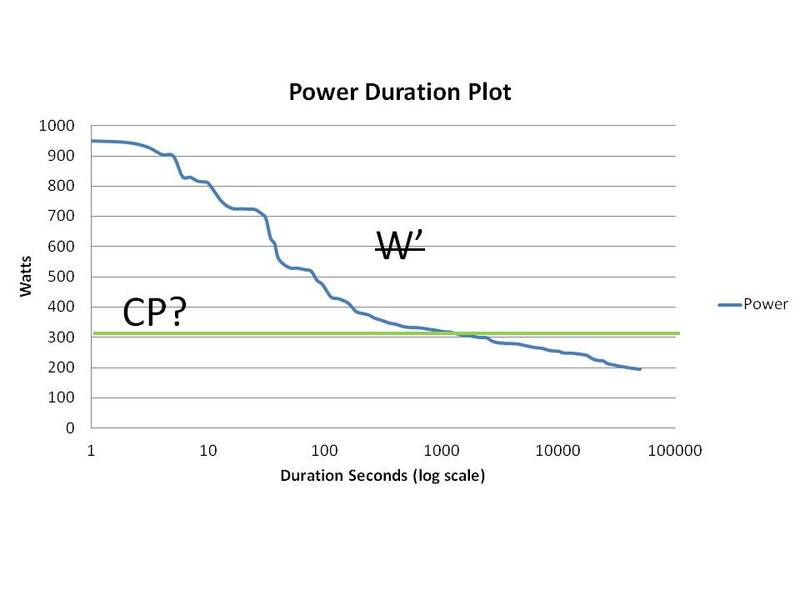 The only way to represent W’ is to plot it with CP in the Critical Power model form. This representation is reasonably effective with high quality data sets but offers little diagnostic utility for typical real world data sets which include significant chunks of submaximal data. 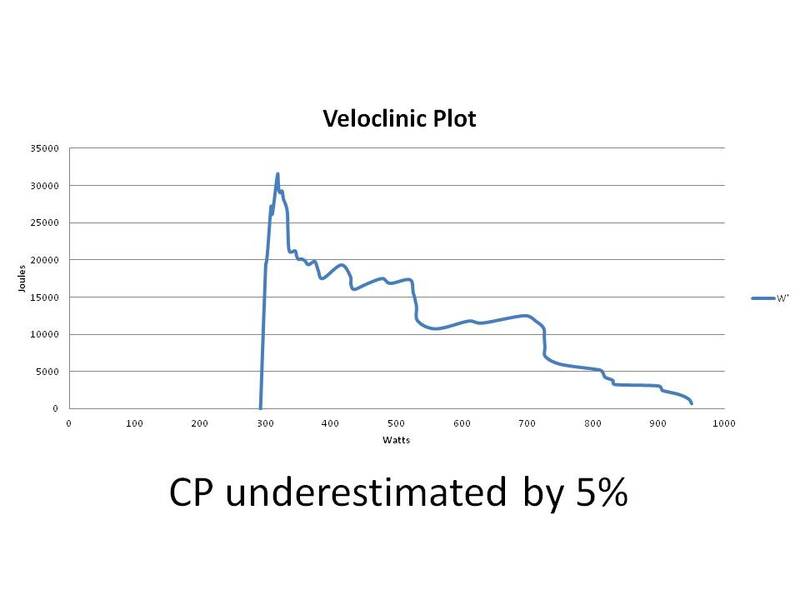 An advantage of the VC plot is that it is obvious if the CP estimate is wrong. In the plot above, I lowered CP by a small but meaningful 5 percent. Underestimating CP skews creates an odd peak above a slanted asymptote. The opposite is true of Inflating CP by the same 5%. This changes creates a notable rightward shift of the asymptotic section producing the windblown appearance above. 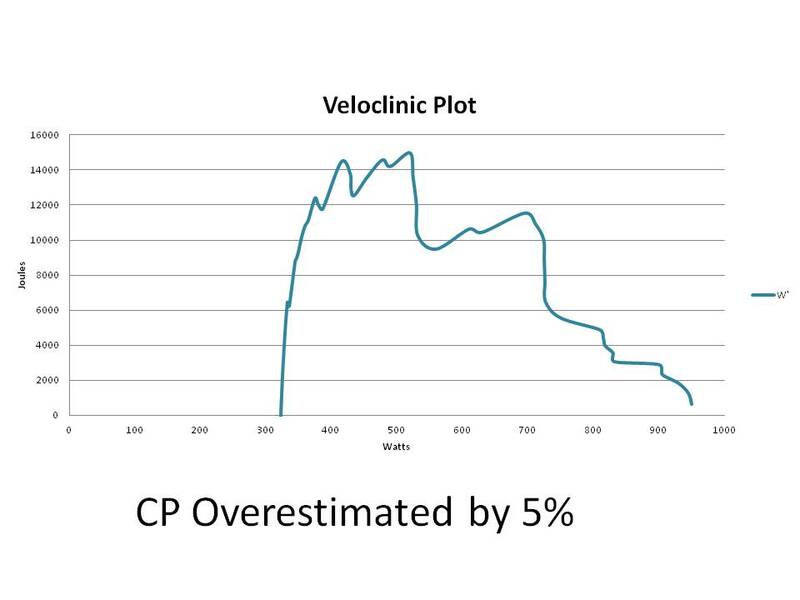 When the CP estimate is correct, and the data is of sufficient quality, the VC plot simply looks right. The plot shows a plateau just above CP corresponding to the valid 2-20 minute region and then a decline towards Pmax. The fit of hyperbolic shapes on the other hand can be difficult to visually assess. The same small but meaningful differences in parameter estimates make no dramatic changes in the shape. The result is the appearance of a reasonable fit simply shifting to a slightly different region of the curve. 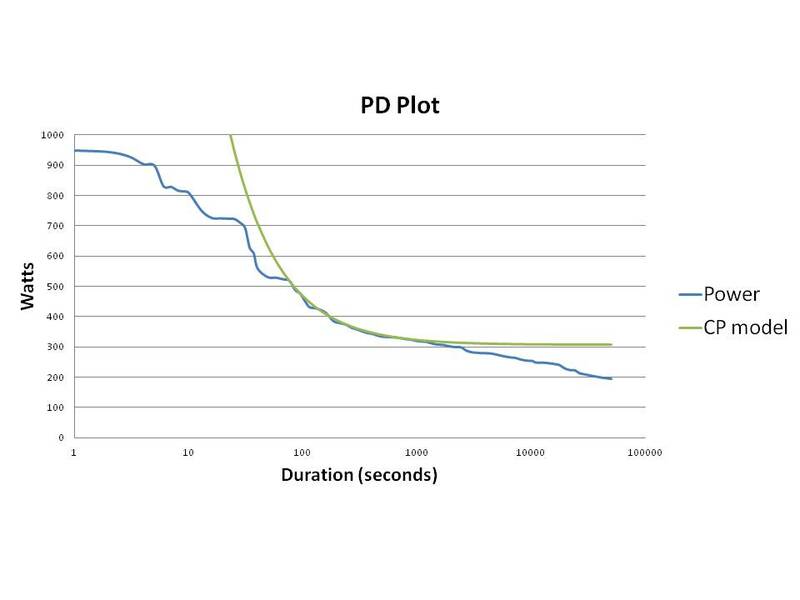 If dealing with data of unknown or questionable quality it is helpful to highlight the region of power corresponding to the 2-20 minute region of the Power Duration curve. The reason to highlight this section of data is that the Critical Power model generally considered valid for maximal efforts of 2 – 20 minutes in length. So this region is were the W’ plateau is expected. In the examples above, 2003 shows a clear underestimation of Critical Power. This is clearly a model fit issue as the far tallest peak of W’ occurs at durations longer than 20 minutes where systemic fatigue should pull performance below the CP curve. In contrast, 2001 shows an odd spike of W’ in the middle of the 2-20 minute region with no distinct plateau. This data set likely contains significant submaximal data and any pararmeter estimates are questionable at best. Note that the flat region of the y asymptote becomes even more distinct, and the goodness of fit of the WS model is visually confirmed by good alignment of the model and subject data. An important detail that now also emerges is a concept that I am calling the Super Critical Power. 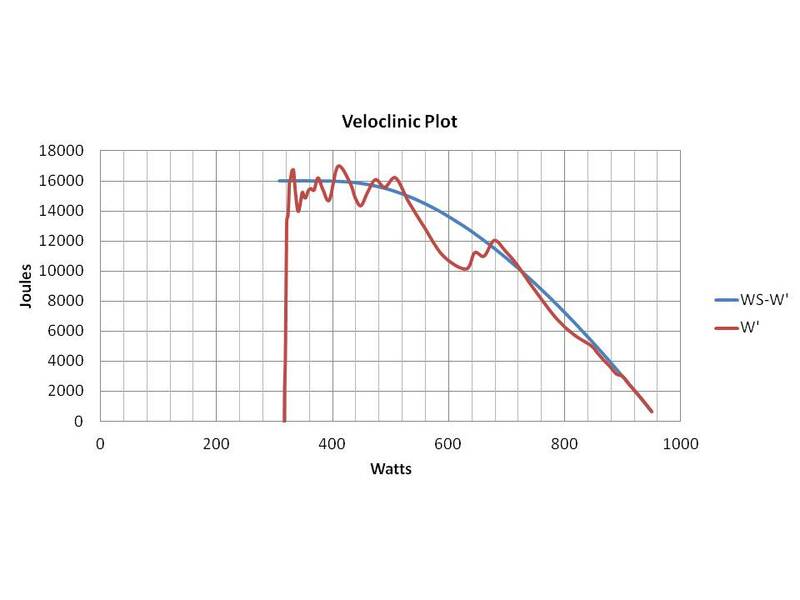 Going from left to right, the VC plot starts at 0 at CP and jumps up to the y asymptote at W’. The flat region at the asymptote represents the range of power where W’ can be fully or nearly fully developed. This region corresponds to the zone of validity of the Critical Power Model where changes in power result in no significant loss in W’ availability. Following this region, the curve falls exponentially away from the asymptote. The implication is of an upper limit were subsequent increases in power results in an exponential cost in terms of a loss of total W’. I am terming this limit, the Super Critical Power. 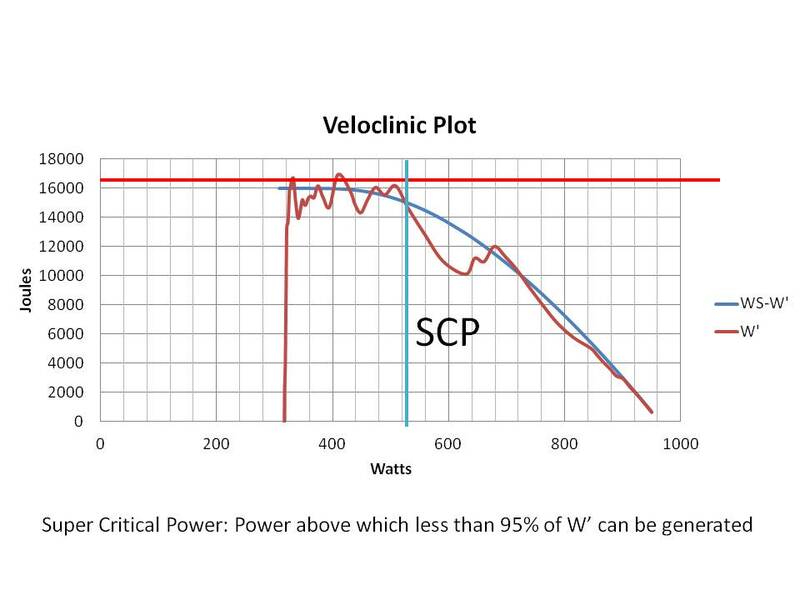 As a working definition, SCP is a power threshold above which less that 95% of W’ can be generated before failure occurs. Super critical power has important implications in terms of Skiba’s intermittent W’ balance model as well as underlying physiological implications. One possible way that VC plot can be used to integrate some of the more interesting physiology publications is to think of the dominant limiters of each zone. I will start with the W’ zone. In my mind this zone may be best explained by complete peripheral fatigue of fast and intermediate twitch motor units. This zone may result from the sequential fatigue of these motor units in a power range that allows for complete depletion without other limiters becoming dominant prior to failure. Evidence for this mechanism comes from studies that demonstrate the development of the the slow component above CP and attainment of VO2max preceding effort failure. Similarly, once failure occurs in this zone, some studies show that outside stimulation of the muscle can not elicit a response greater than voluntary contraction. In order for this to occur, it follows that all easily fatigueable intermediate and fast twitch motor units must have been fully recruited and depleted. In contrast, fatigue generated by efforts above SCP have been shown to not necessarily produce complete peripheral fatigue. When fatigue is produced near maximal efforts, external stimulation can potentially generate muscle contraction greater than voluntary contraction. These findings suggest that a central fatigue or excitation contraction uncoupling occurs resulting in sub-maximal motor unit recruitment. Similarly, I anticipate that SCP should correspond to a threshold power above which failure occurs before complete development of the slow component and therefore VO2max can not be reached. 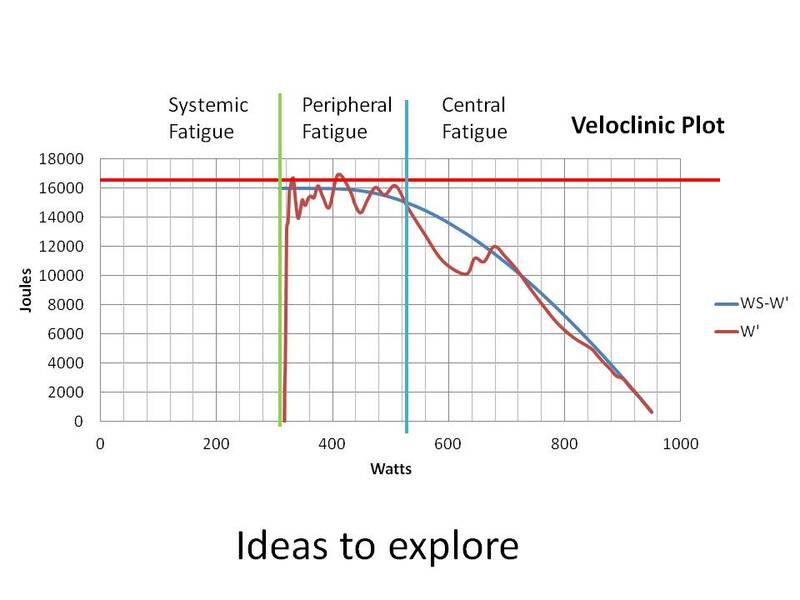 Lastly, below CP studies show that the slow component does not fully develop and VO2max is not reached. VO2 kinetics are paralleled by findings of variability in sequential motor unit recruitment and lack of complete recruitment. Failure in this zone is potentially a multi-factorial systemic mechanism or may be dominated by a specific factor during severe conditions such as fuel depletion, temperature dis-regulation, or as a protective central feedback mechanism.